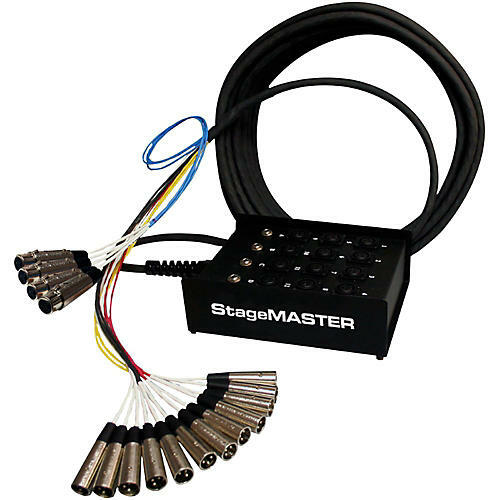 Open Box Pro Co StageMASTER SMC Series 12-Channel Snake 100 ft.
StageMASTER SMC Series 12-Channel Snakes (12 send, 4 return) are designed and built to provide the greatest value possible. StageMASTER Stage Snakes are not outsourced. They are manufactured in Pro Co's own facilities, by their employees, according to the strictest quality standards. Pro Co takes pride in providing you with a system that you can rely on at a price you will appreciate. Each StageMASTER Stage Snake stagebox is constructed of a steel connector panel chassis and a heavy-duty steel U-channel enclosure designed for excellent shielding and protection of connectors. The stagebox is coated with a durable black powder-coat finish with white silkscreened channel identification numbers. Mic inputs are rugged Neutrik "D" series nylon XLR panel connectors and returns are either "D" series-type connectors or durable metal 1/4" T/R/S Panel Jacks (as designated). The stagebox is wired with SN Multipair Audio Cable to a 2, 3 or 4 foot Fanout (determined by total number of channels) with RHC Male XLR connectors and RHC Female XLR connectors or 1/4" T/R/S Phone Plugs (as designated). The cable is secured to the stagebox with a rugged nylon strain relief. The individual channels of the Fanout are protected with color-coded irradiated polyolefin shrink-tubing for long flex-life and easy channel identification. Various lengths available. Please see drop-down menu to the right to choose.